In today’s competitive world, many children are developing stress-related health issues that can affect their ability to function and live up to their potential. 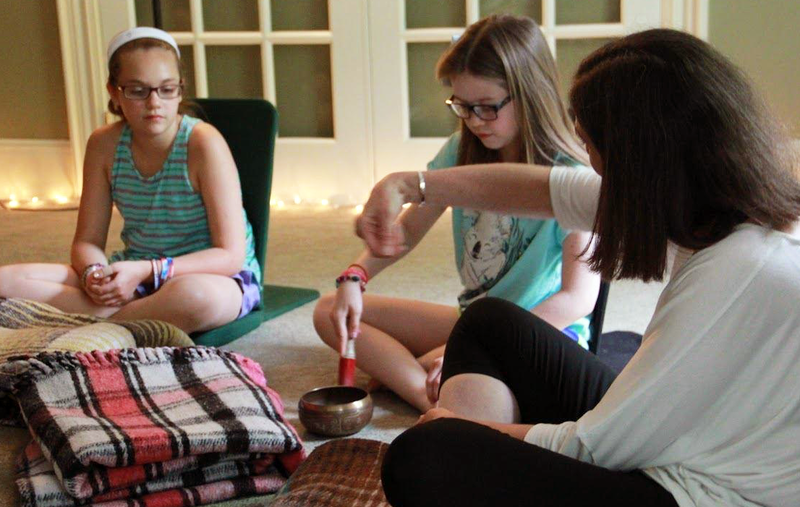 Creating Calm has special classes and programs for kids and teens (ages 5+) to reduce stress and anxiety, health and healing, and a more balanced, productive life. Creative Calm offers a highly lauded stress reduction program created by founder Marci Zieff. The program helps teens, children, and kids with special needs (including those on the autism spectrum) by incorporating breath work, stretching, guided meditation, walking, and dance meditation into learning self-guided calming and strengthening their own bodies and minds. With her gentle demeanor, deep compassion, vast education, and highly-tuned intuition, Marci helps kids find pathways into power over their own healing, teaching techniques connecting them with their inner self, imagination, and the essence of who they are. These techniques can be used any time and (almost) anywhere. Students will be taught several techniques to help them connect with their inner self, including their imagination and the real essence of who they are. Once learned, your child will have access to a complete set of tools that can be utilized throughout life to help provide inner peace and calm. • Provide our students with a variety of tools for optimum stress reduction through breath work, guided meditation, yoga moves, and self-healing techniques. • Provide a positive, calming environment for open discussion about when and how to use these tools. • Notice when stress arises, ways in which we hold our stress, and how that feels in the body. • Investigate when and where to incorporate ways of self-regulation when dealing with physical or emotional pain. • Provide suggestions for practicing these techniques during times of stress. • Help to reduce anxiety and maintain focus. • Help to redirect the flow of emotions that occupy the mind by practicing mindfulness and gratefulness. Participating in meditation classes reduces stress and helps to create calm and focus. This class is specially designed for children. Guided meditation, yoga stretches, moving meditation and various calming techniques will be introduced, providing students with tools for use in school and at home. Most of all its fun and your children will love it! Appropriate for those with ADHD/ADD and/or anxiety. Currently running through Aspirations program in Sudbury, MA, and Concord Park and Recreation department in Concord, MA. Teens are experiencing more stress than ever in their busier lives, often with little opportunity to relax and unwind. In this class, teens will learn breathing techniques, mindfulness, guided meditation, yoga stretches, moving meditation, and many other valuable relaxation tools. These tools can help reduce stress and bring each teen’s best qualities to the surface. The many benefits include improved focus, better relationships, greater health, and better sleep. Best of all, it’s fun, relaxing, and your teens will love it! Each session focuses on various calming techniques including breath work, mindfulness, guided meditation, gentle yoga stretches, and walking meditation. Over time, students begin to tune in to what helps them calm their bodies and minds and use tools to help provide inner peace and calm. Appropriate for all levels. During sessions, we create an individualized plan for stress reduction. Techniques and plan will be adjusted accordingly depending on the needs of the individual. Students learn a variety of tools for optimum stress reduction through breath work, guided meditation, yoga moves, and self-healing techniques in a positive, calming environment with open discussion about when and how to use the tools. Students also learn to be more aware of when stress arises, how we hold our stress, self-regulation, gentle instruction on how to use stress-management techniques, and redirect the flow of emotions that occupy the mind by practicing gratefulness. Concerned about your child’s health and well-being? Looking for holistic ways to help your child manage stress and anxiety? Kids (ages 5-12) who have taken the classes report feeling more relaxed, more focused and less anxious. 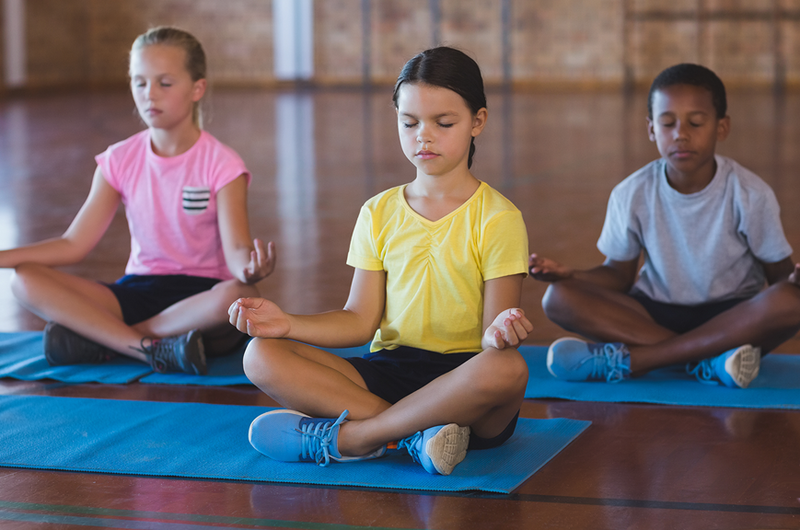 Meditation class introduces a fun and accepting atmosphere where kids learn through guided meditation, playful yoga stretches, moving meditation, tools for stress management and reduction, and various calming techniques perfect for school and home. The many benefits include improved focus, better relationships, anxiety reduction, greater health, stronger self-awareness, and better sleep. The classes are fun, and are very helpful for those with stress, anxiety, and/or ADD/ADHD. Most of all, children love it! Practicing Tae Kwon-Do is a wonderful vehicle for strengthening the body, creating a focused mind and enhancing self-control. In this class your child will learn basic Tae Kwon-Do moves while building strength and coordination and endurance. The rules of Martial arts respect, responsibility and self-control will be emphasized. We begin with a warm up; learn how to form the tools needed for correct punches kicks and chops, practice the moves we learn, and end with a fun game designed to increase focus and listening skills. Our principle Marci Zieff consults with families on a private basis to help reduce stress and anxiety. Each session is tailored to meet the specific needs of your family, and includes a variety of calming techniques including meditation, reiki, and/or Tae Kwon-Do. We will custom create a plan for you that will encourage a peaceful home environment. Reiki is a safe and effective healing treatment for children, teens, adults, the elderly and those with special needs. Reiki works on all levels of being: body, mind, and spirit and can be combined with traditional medicine and other alternative methods. Private Reiki treatments are available for ages 4 and up. Private one-hour sessions for children and teens are tailored to meet the specific needs of your child and can be a combination of Reiki, meditation, breath work, self-healing techniques and stretching. All of these techniques help to calm, relax and heal the whole individual. Depending on the age of the child, parents may be present in the room during a Reiki session. • Reiki offers relief of both physical pain and emotional distress, and aids in the healing process. (but does not replace consulting your doctor). • Reiki is calming and balancing. • Reiki helps to speed up recovery from surgery or a long-term illness. • Reiki is recommended for ongoing health maintenance. It promotes strong health and prevents illness. • Reiki energy medicine is always for the greater good and never harms. • Helps to reduce anxiety and maintain focus. Our principle Marci Zieff meets privately with you to create an individualized plan for stress reduction that can increase your overall well-being and easily be incorporated into your busy lifestyle. The class is available for children, teens, adults and those with special needs including those with Autism spectrum disorders. Whether you are looking to improve your health, manage stress due to illness or relieve symptoms of stress or anxiety naturally this is a great option. You will learn a variety of tools including breath work, guided meditation, Native American healing techniques, gentle stretching, walking meditation and more. You will learn how and when to incorporate these tools into your life and, when used consistently, emerge a happier and healthier individual.